RAD filter fits the Seychelle 28 oz. Flip-top Filtered Water Bottle, the Water Pump and the Canteen with a check valve in the lid. 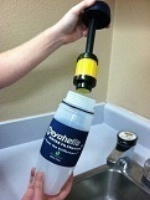 This Seychelle RAD filter fits the 28 oz. fliptop water bottle, the pump and the 38 oz. canteen as long as the canteen lid has a check valve (a white plastic valve attached to the inside of the cap). If your canteen does not have the check valve, you can get a new cap that does. Call us for more details at 866-875-4386. The RAD filter is ideal for any outdoor use, like traveling, hiking, biking, camping, fishing or for emergency purposes. It can be used with any type of water source; tap or rainwater, rivers, streams or even lakes (excluding salt water). Up to 99.99% of Radiological Contaminants such as Gross Beta, Radon 222, Radium 226, Plutonium, Uranium, Cesium 137 and Radioactive Iodine 131. Removes up to 99.99% of all major nuclear contaminants that can be found in drinking water. Produces up to 100 gallons of filtered water in the 28oz water bottle depending upon the quality of the source water with the bottle; and up to 150 gallons for the water pitcher! Produces up to 50 gallons on the drinking straw! Reusable - made of FDA approved plastics - will not leach!